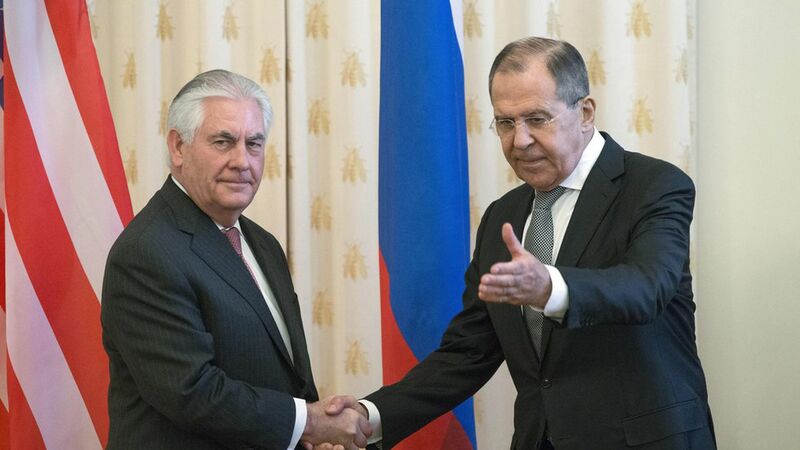 Rex Tillerson and Russian Foreign Minister Sergey Lavrov held a grim press conference following a 2 hour meeting between Tillerson and Vladimir Putin, with the U.S. Secretary of State conceding that U.S./Russia relations had reached "a low point." "The world's two foremost nuclear powers cannot have this kind of relationship." Tillerson accused Assad of using chlorine bombs and other chemical weapons on more than 50 occasions. He said: "Clearly our view is that the reign of the Assad family is coming to an end," and that Russia is best placed to convince Assad that's the case. Russian interference in elections "is fairly well established" and might merit more sanctions, but was only "briefly" mentioned in the meeting with Putin (Lavrov said the U.S. had no evidence it took place and had made no sanctions threats). Called for an "unbiased" and "frank" investigation into the chemical weapons attack in Syria, just a day after U.S. officials accused Russia of attempting to "cover up" the Syrian regime's culpability. Lavrov issued a roundabout warning over potential U.S. efforts to remove Assad, saying he hopes Iraq and Libya serve as examples. Called for "common sense," claiming that if Assad is ousted, ISIS may fill the void. Said they discussed the crisis in Ukraine and agreed that the Minsk peace accords are the only way forward, and spoke about North Korea.